Interests:I love just about anything outdoors, hunting, fishing, camping, and just starting prospecting. I am married and have a 1 year old little boy. Anything else you want to know, just ask! Do you all think that there is Gold in southwestern Virginia? I have been wanting to get me a pan and a few other things and start looking for it here. I am wondering if it is geologically correct for gold to be here. Any info would be greatly appreciated!! Thanks in advance and good luck with your huntings! It depends on how far west you are, the following map shows where the most likely areas that you might find native gold in the eastern states, this map is from the late 1800s and it is not perfect, as there is some gold found in southeastern Tennessee and south of there into Georgia, and the Georgia South Carolina southern portions are a bit to far south, there is a narrow gold belt along the S.C. and Ga. border around Augusta, but no gold to speak of between there and a little north of Atlanta, but otherwise it is OK to go prospecting with. 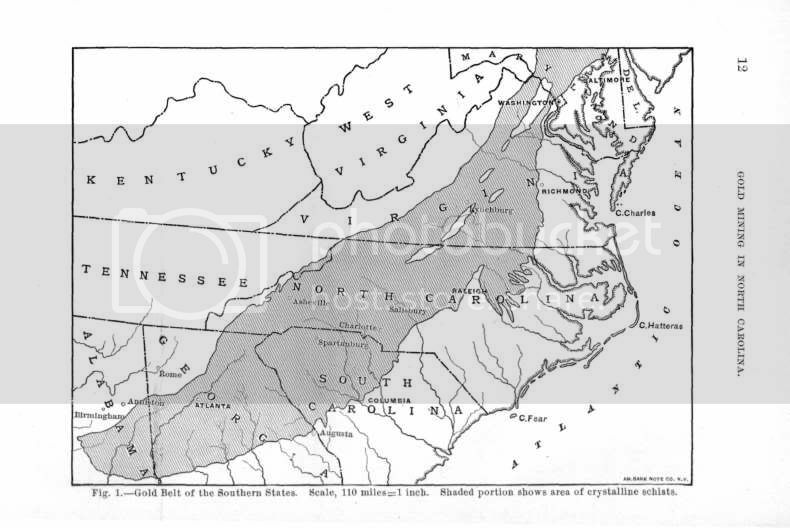 Also a map of the gold pyrite belt of Virginia, the red dots are where gold mines were/are located. Thanks for all the input guys. I live right on the kentucky border in the mountains. Do you think that there is gold this far off of the gold belt? And also, is the gold found here mostly small, flaky gold? I dont know much at all about the types of materials associated with gold, but there is a lot of sandstone with little white pebbles that I think is a type of quartz. Also me and a friend tried panning one time and found a good amount of black sand, is that a good indicator that gold might be here? Thanks again for the input, really informative! you should hook up with blarney stone who has posted on this forum recently/ he has been working areas in north carolina/ he is new to prospecting and panning. i tried a few times in the big orange state with no luck there. again i wA ONLY LEARNING ABOUT PANNING. AND BY THE WAY DONT BE SNEAKING UP ON ANY OF THE MOON SHINERS UP THERE IN THE WOODS. lol.